10th April 2018: new modulation and FEC on 12129 V, 12207 V and 12402 V.
17th April 2018: new modulation and FEC on 11817 V, 11856 V, 11894 V and 12012 V.
15th May 2018: new frenquency (1 TF1, 10 TMC, 11 TFX, 12 NRJ 12, 13 LCP, 16 CNEWS, 17 CSTAR, 21 L'ÉQUIPE). 3rd September 2018: 23 NUMERO 23 replaced by 23 RMC STORY. Strong decoder SRT7404. I have 85% signal strength and 91% quality but no channels detected. Any ideas? 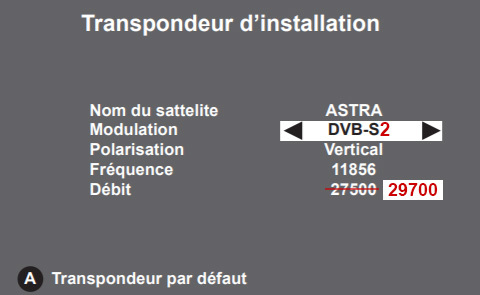 Satellite dish antenna pointed to wrong Astra (28.2º East for example). This is what TNT sets up on my TNT box. 20 = HD1 12207/V/29700 22 = 6TER 12669/V/22000 26 = LCI 12207/V/29700 40 = FRANCE24 11538/V/22000 41 = EURONEWS 12226/H/27500 301-324 France3 regions. Also, although the odd program is available on Canal (and canal sport and Paris Premier) I would not list them as FTA as it is very few programs that are FTA. A few years ago, CNN International disappeared from the TNT service. Last week, (30/09/17) BBC WORLD disappeared when it moved to a different satellite or frequency. How can one contact TNT to ask them to re-instate those channels? Since the 15 May I do not receive TF1 and other programmes associated- -I have a Strong HD SRT7404 - card still valid another year 1/2. 1 August 2018 Suddenly no signal for any French channels on TNT SAT Explanation? Only French ? Have you signal for the additional channels (the German...) from 1000 onwards (with a global search) ? No, the orbital position is always the same. Numero 23 no longer exists (11894 V). It has been replaced by RMC Story. Yes, indeed, the 3rd September 2018, but the identification name in the channel list has not changed, it's always NUMERO 23. I have two TNTSAT HD boxes with cards valid until 2021, and living in Norway. Reception via a 60cm dish has been good for years, until ca. 1 month ago when one afternoon when turning on the Box, no TV signal arrives via the Box. It seem to communicate well With the TV. Do you have an explanation ? 27th November 2018 Service name changes from NUMERO 23 to RMC STORY. Wind blew down our dish. It was at Astra 19.2e. Have WS6906 which says dish is on 19.2e and sees many hundreds of channels, but the TNTSat receiver does not find any channels. What might I be doing wrong ? Probably the antenna is pointed to another satellite. Tell me four o five channels names founded by WS6906. Mistyped the device, is a 6916. S and Q is 77 and 67 respectively. 700 odd TB channels seemingly on Astra 1 1. Example channels are : Antena 3 HD on 10907/21996/V and BBC World News Europe on 11230 /21996/V or TNT on 11856 / 29700 / V or One Hd on 11053/ 21996. The TNT on 29700 is no signal. The others are fine. The Astrell receiver is looking for primary and secondary transponders as follows: P 11856, 29700, V; S 12402, 29700, V however nothing is found. There is not DiSEqC fitted as yet. Any help Much appreciated as we have French guests arriving tomorrow. When Insay nothing is found I mean the group of tnt say channels. The receiver does pick up a few hundred other channels. No, TNT. The S and Q is as above 77 and 67. I have reset the receiver a number of times. Can strength/quality vary between transponders ? Do I need a bigger dish. It’s a oval dish. Dish is new but LNB is not. Misread your question. For the TNT channels, the S and Q on the receiver is 43 and low thirty something but not constant, it flickers. It is the higher numbers for the other channels and signal is constant. TNT Auto setup finds nothing. A global search finds the other channels. TNT (channel name) is on 10979 V, not 11856 V. A symptom ? "Can strength/quality vary between transponders ?" Of course, each transponders signal strength and quality vary based on many factors. To generate the TNT Sat channel list, the receiver requires enough quality signal on 11856 V or 12402 V, at least on one of them. "Do I need a bigger dish." I don't know. Where are you ? How big is the dish ? "Dish is new but LNB is not." "For the TNT channels, the S and Q on the receiver is 43 and low thirty something but not constant, it flickers." According to the user manual the quality signal must be over 40% (measured by the receiver) on each required transponder. Apparently your installation is not ok, poor signal (dish incorrectly mounted or aligned, wrong skew adjustment, problem with cable, connections, LNB...). I repeat this question: do you receive channels on frequencies over 11900 MHz ? 11954 H, 11973 V, 12051 V... ? You can always call a professional installer. I have done a factory reset on my Humax as the TNT SAT cards stopped working even though brand new. I am trying to reload all French channels as before but I only get German channels installing. Am I doing something really stupid? If you can watch Swiss channels too, you must have a Fransat decoder with two smartcard readers (one for Fransat smartcard, the other for SRG SSR smartcard) instead of a TNT Sat receiver (there are none with double smartcard reader). Do you receive RMC Story via TNT Sat, Fransat or Bis/Hotbird? 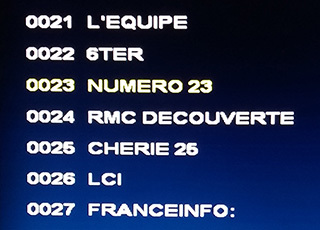 2nd April 2019 Mise à jour de chaînes NRJ 12 / RMC Découverte new frequencies.